Valentine’s Day is this week. I know there are a lot of you out there with gadget-loving girlfriends, fiancées and wives that you still haven’t bought something for that lovey-dovey day yet. Never fear. 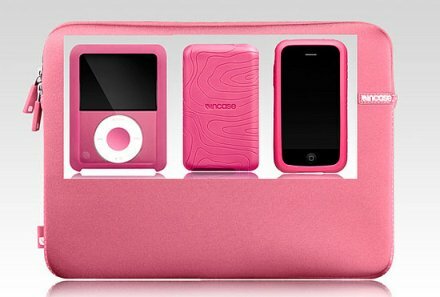 Incase has a slew of pink cases for a number of Apple’s products that will help protect your sweetheart’s gadgets and give you some bonus points for being a thoughtful romantic. With a durable neoprene exterior, cushioned interior, and perforated trim, the Neoprene Sleeve offers complete notebook protection. Whether utilized as a stand-alone case or placed inside a pack, the Neoprene Sleeve provides exceptional protection and simplicity. These protective products do come in a variety of other colors too, so if your Valentine loves green, get her that color instead!